Location: Aortic plexus, above the sacrum bone. Vibrations: Swadisthan vibrations are felt in the thumb. Associated Element: Swadisthan is aligned with the purifying element of fire. Associated Color: Yellow. May represent the element of fire or flame and is perhaps symbolic of the creative energy required to form atoms and molecules and bind them together into the very elements that comprise our existence and the existence of the universe itself. Physiology/physical regions governed: Liver, kidney, spleen, pancreas, and female reproductive organs. Swadisthan’s fundamental quality is creativity. It is through this chakra that inspiration is born and creative energy is generated. In fact, with regular meditation, creative solutions to problems or challenges may seem to appear arrive spontaneously, no deliberate intent or concentration required. Swadisthan also governs attention and our ability to distinguish and assimilate pure knowledge. From these qualities, we discover that the beauty and power of creation is already reflected within us, an infinite reservoir, waiting to be tapped. In controlling liver function, Swadisthan plays an important physiological role in fat metabolism, breaking down fat particles to supply the brain with necessary fuel and in the process, preserving white matter and gray matter integrity. 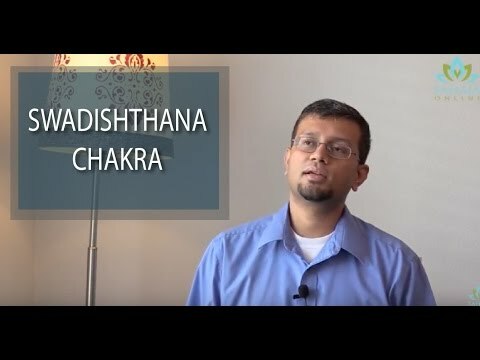 Swadisthan influences the communication pathways between the liver and the brain that govern neural activity (such as attention), which, in turn, can ultimately lead to cognitive, emotional and behavioral changes. It is through Swadisthan that we receive the gift of pure attention. Pure attention is pure concentration, observation, witnessing. It excludes thought, which emanates from the ego (our “I-ness” or sense of self) and superego (our past memories and conditionings). It allows us to, for example, simply focus on and appreciate the beauty of a flower without getting caught up in the mental busyness of factual details (e.g., its name, species or blooming season). As we become more and more successful in our creative endeavors, it’s easy for the ego to drive us to chase “even greater successes.” But living in overdrive — overthinking, overanalyzing, overplanning — can eventually exhaust the right side Swadisthan, which can cause future creations to be flat, lifeless or derivative. This excessive drive to recreate past successes also tends to kill passion, spontaneity and joy. When the brain kicks into overdrive, the liver is susceptible to “overheating,” a condition which can be further exacerbated by alcohol, stimulants, and poor nutrition. Liver overheating has a detrimental effect on our attention, which, in turn, weakens the power of meditation that might have helped restore balance. When excessive energy is devoted to thought, Swadisthan is forced to neglect other organs it’s supposed to be taking care of; for example, the liver has to work harder to meet the body’s metabolic demands. The result is that focus and pure thought are compromised. A healthy, balanced liver filters out impurities and waste, nourishing and purifying the brain’s attention centers. We are less vulnerable to distractions, irrelevancies and external clutter.From this purified attention comes the peace and tranquility that helps us not only meditate more effectively, but also allows us to maintain equanimity for the longer term. Confusion, worries, doubts, and useless distractions disappear. Our desires become more pure, constructive and benevolent. We don’t waste energy on unimportant or impure knowledge, false philosophies or false gurus. Swadisthan infuses our creative endeavors with passion and soul. The quality of pure knowledge that’s associated with Swadisthan is the innate knowledge of the absolute. It is subtle and intuitive, far beyond than the mundane knowledge that we acquire through traditional learning techniques. In contrast, pure knowledge will seem to simply occur to you or emanate from within. Answers to questions and solutions to problems will often seem to arrive spontaneously, no deliberate intent or concentration required. “Inspiration” becomes less a rarity, more a common occurence. Black magic and occult practices can damage Swadisthan and may lead to lethargy, increased overall negativity, and possibly even hallucinations.